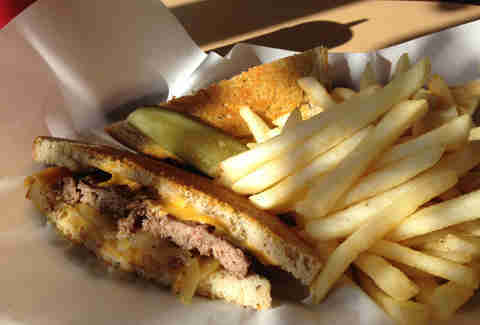 History tells us the patty melt was invented in California in the late 1940s. We say history is super dumb. Sure, maybe the name was coined then, but you don't think some guy with a handlebar mustache was housing a patty on hearty German rye bread with cheese, grilled onions, and a tall lager a century ago? 'Cause he totally was. Annnnnnyway, whoever and wherever the inventor was, the sandwiches they invented are delicious, and you deserve to be eating the best of 'em, so here they are: Chicago's 11 finest-est old-school melts. Taking the traditional patty melt into bold new frontiers of stuffing your face, two patties of Black Angus beef with Swiss cheese and caramelized onions are squeezed between a pair of bacon grilled cheese sandwiches (wuuuuuuuuuuut), and served with tots and tomato bisque. On the menu, it’s just called a “hamburger sandwich” -- which is what Chef Kevin Hickey’s grandmother called it at the original Duck Inn (which she had back in the 1930s). But in all but name, it’s a classic patty melt featuring everything from fresh-ground beef to Brun-uusto cheese, all cooked on the grill and assembled piping hot. 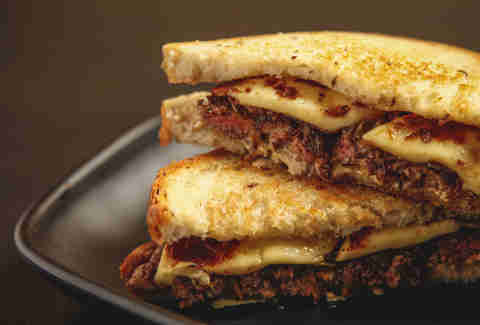 Edzo’s built an audience by taking burgers back to the basics, and the patty melt is simple but textbook-perfect with crispy marble rye encasing beef, gooey American cheese on both sides, and plenty of caramelized onion oozing out. You might expect this vintage deli-diner (which started as a steam table deli in 1938) to serve a classic old-style patty melt. But you would expect wrong. Somewhere along the way somebody went crazy with the idea, and the massive, nap-inducing Fatty Melt holds the patty, onion, and cheese between two full grilled cheese sandwiches -- one with tomato, one with bacon. This burger shop, featuring owners the Hearty Boys and Chef Gale Gand, puts a bit of a chef-y spin on burger classics, topping its patty melt with sweet balsamic-caramelized onions and garlic aioli. But hey, it works. This 24hr grill (with a regular cast of interesting characters) makes what looks at first glance like a pretty standard, no-frills patty melt. 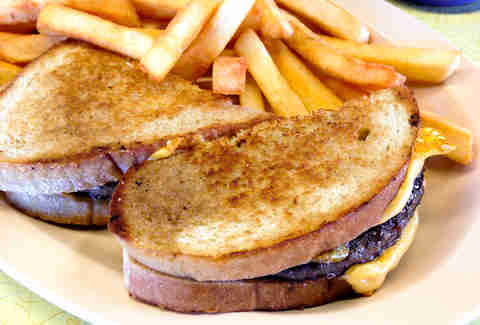 But with its gooey American cheese and onions fresh off the well-seasoned grill, this standout p-melt creation is the definition of more than just the sum of its parts. 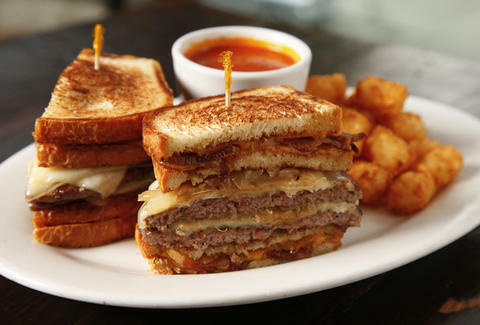 Diners are as good a place as any to look for killer patty melts, and Eleven City Diner wins a prize for being one of the gooiest, with its Angus patty topped with both cheese and Thousand Island dressing, Reuben-style. The name suggests something grander than the strip mall hot dog stand this place turns out to be, but it’s a solid Greek fast-food joint that does an above-average job with all the Chicago classics, including a lightly grilled, perfectly professional version of the patty melt. 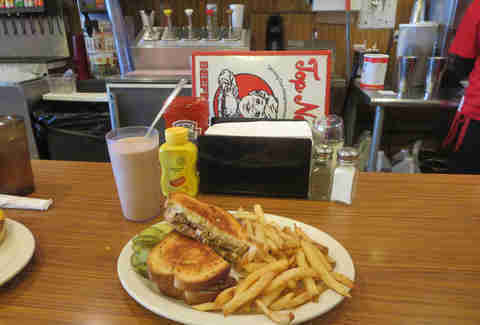 Where else besides a Jewish deli would you look for a manly, old-school sandwich like the patty melt? How about a bar and grill in the Board of Trade? No commodity meat is being bought and sold here, however, as the staff grinds their own grass-fed beef in-house for a hand-packed patty at one of the few places where we were asked what temperature we wanted ours cooked to. A South Side fixture since the 1940s, this burger joint is like ground control for all burger experiments. 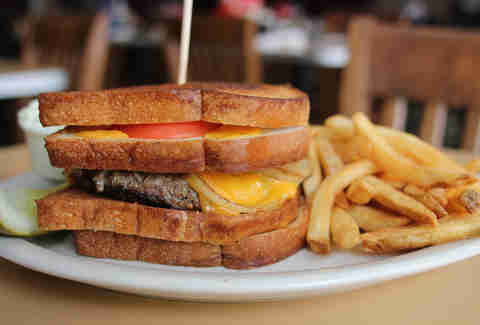 And its vintage patty melt is certainly no exception. The ground-in-house beef is always excellent, and we really, REALLY like the caraway seed kick of its formidable rye bread. Given the morning-after-a-big-night-helping menu of pork belly pancakes and breakfast spaghetti, the patty melt at Little Goat is about as traditional as Stephanie Izard gets. Pretzel rye gets spread with special sauce and piled with a burger, American cheese, and caramelized onions. The only unusual touch? Pickle slices.